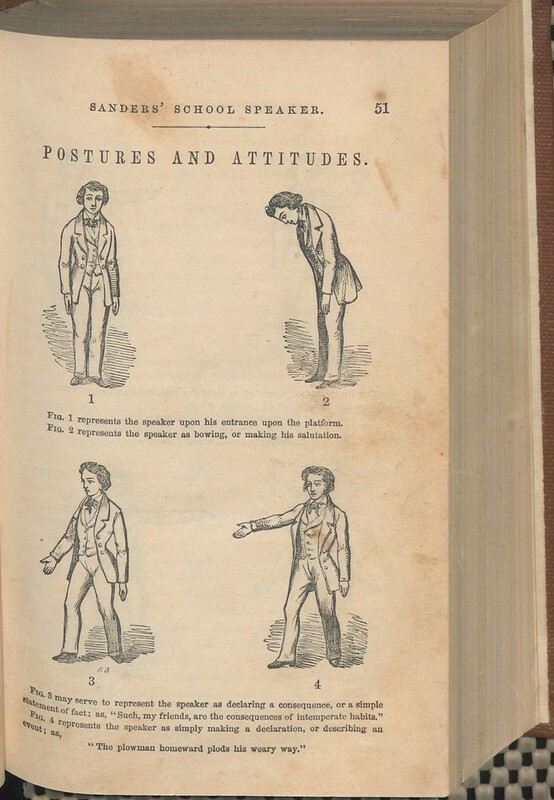 These postures and attitudes were meant for 19th-century students to use when practicing speech-giving. Presented as illustrations in Charles W. Sanders’ Sanders’ School Speaker: A Comprehensive Course of Instruction in the Principles of Oratory; With Numerous Exercises for Practice in Declamation, the figures advised students how to use their bodies to heighten the effect of their delivery. Sanders’ 1857 book (viewable via the Internet Archive) is only one of many such elocution primers available for classroom use in the 19th century, when oratory was quite commonly included in curricula. Sanders’ compendium contains a short section on principles of elocution (how to modulate speech; when to pause) and a section on gesture, illustrated by these images. The bulk of the book is filled with “Exercises in Declamation”: texts that the student could memorize, then use to practice these principles. As we declaim like Demosthenes, we might recall that it was on this date in 1717 that the Rev. 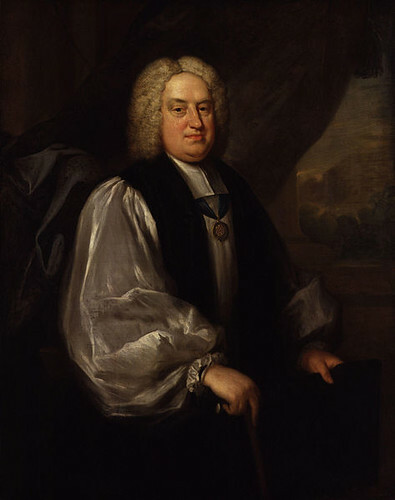 Benjamin Hoadly, the Bishop of Bangor, delivered a sermon to George I of Great Britain on “The Nature of the Kingdom of Christ.” Starting from John 18:36 (“My kingdom is not of this world”), Hoadly argued, supposedly at the invitation of the king himself, that there is no Biblical justification for any church role in “earthly” government at any level. He identified the church with the kingdom of Heaven—it was therefore not of this world. The sermon was widely published, and initiated the “Bangorian Controversy”– an argument within the Anglican Church over its appropriate role. Most of the established leadership of the Church– the official religion of Britain– enjoyed its political prerogatives and had no interest in eschewing them. George I, for his part, was interested in weakening the power of the House of Lords, in which those same Anglican Bishops sat and voted. In the event, there was no real immediate change.